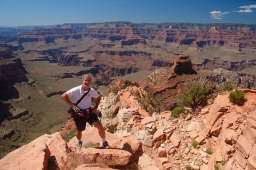 One of the most popular sections of my website over the years has been my hiking stories and accompanying photos at the Grand Canyon (GC). My original intention was simply to show interesting pictures of the trails and the scenery to give the hikers a "trip down memory lane" because taking a lot of pictures is not a priority for most doing the trek. After all, photos of the Grand Canyon just can't do it justice because you can't capture how big it is. And then, even standing on the rim though it seems big, you don't know exactly how big until you start hiking down one of the trails. But I soon learned that I had a bigger audience and that was perspective hikers of the Grand Canyon as it was being used as a sort of training guide. What most wrote was that they appreciated getting a better idea of what it was going to be like. Consequently, I started modifying the text to provide additional information. However, is this my primary audience? I don't think so, but most of my correspondence is obviously from the planning group because they are likely to have questions. Running? As I joke I'm not a runner! But I love hiking. I can thorough exhaust myself on a trail and still be having fun while only 10 minutes into a run I'm already wishing I were done. When training for a Grand Canyon dash I will do "laps" at the local mountains around Phoenix and though I'm extremely tired already, turn around and go up the mountain one more time. But when out for just a jog, I will never choose a route that takes me past my house because I will not continue afterward. 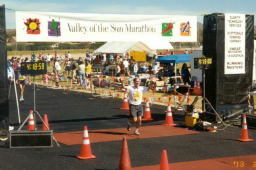 I run because I have to and it was always in conjunction with training for a big hike. But, finally, I decided that finishing a full marathon was on my bucket list. A Virtual Hike in the Grand Canyon! Description and pictures that for most will be the hike of a lifetime: down the South Kaibab Trail to the river and Phantom Ranch and then up the Bright Angel Trail. You'll find pictures along the entire route. You have to start somewhere. This is my account of my love affair with going down the Grand Canyon via the South Kaibab Trail. Armed with my SLR camera, I dash down and up the South Kaibab Trail with friend Ron Hendricks. This hike proved what I already knew: this hike can kill you if even if you're well prepared. Another hike with Ron Hendricks. This time doing the South Kaibab to Bright Angel route (the one described in the Virtual Hike. Not a whole lot of pictures as the weather did not cooperate, but without the weight this became a very fast hike, completing the route in just over 4 hours. And yet another hike with Ron Hendricks who is a multiple Ironman Triathlon finisher. This time going rim to rim in one day, going North to South. Down the North Kaibab Trail to Phantom Ranch and then up the Bright Angel Trail. After many "marathon" hikes down the Grand Canyon, I foolishly give a 26.2 mile run a try without anywhere near the necessary training.